This volume brings together the most innovative historical work on the conjoined themes of gender and consumption. 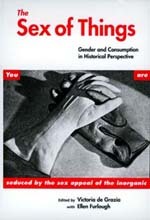 In thirteen pioneering essays, some of the most important voices in the field consider how Western societies think about and use goods, how goods shape female, as well as male, identities, how labor in the family came to be divided between a male breadwinner and a female consumer, and how fashion and cosmetics shape women's notions of themselves and the society in which they live. Together these essays represent the state of the art in research and writing about the development of modern consumption practices, gender roles, and the sexual division of labor in both the United States and Europe. Covering a period of two centuries, the essays range from Marie Antoinette's Paris to the burgeoning cosmetics culture of mid-century America. They deal with topics such as blue-collar workers' survival strategies in the interwar years, the anxieties of working-class consumers, and the efforts of the state to define women's—especially wives' and mothers'—consumer identity. Generously illustrated, this volume also includes extensive introductions and a comprehensive annotated bibliography. Drawing on social, economic, and art history as well as cultural studies, it provides a rich context for the current discourse around consumption, particularly in relation to feminist discussions of gender. Victoria de Grazia is Professor of History and Director of the Institute for Research on Women and Gender at Columbia University. She is the author of How Fascism Ruled Women: Italy, 1922-1945 (California, 1992). Ellen Furlough is Associate Professor of History at Kenyon College and author of Consumer Cooperation in France (1991).